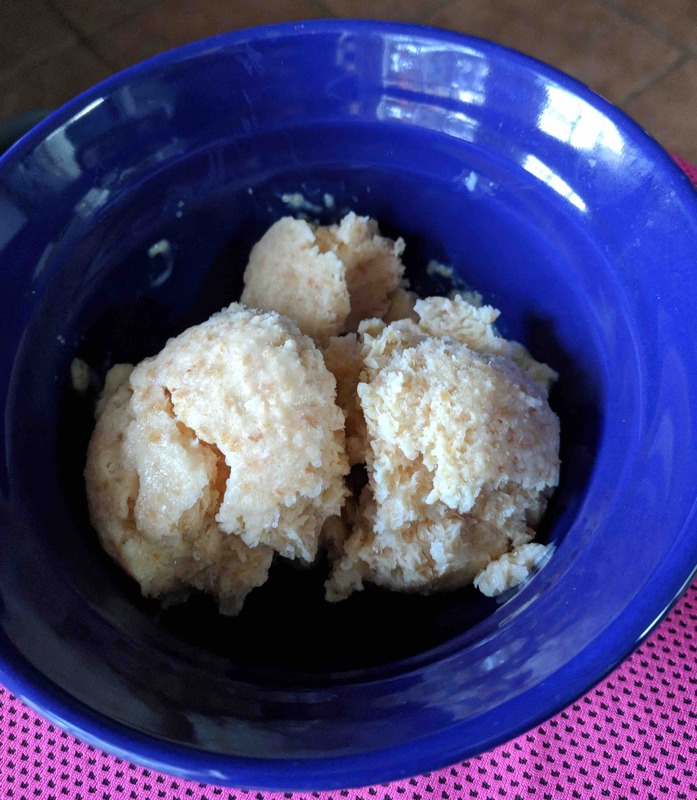 We made gelato (see recipe here) and had a bit of heavy whipping cream, a tad of evaporated milk and smidgen of sweetened condensed milk left over. After pondering and googling, we decided to puree it all with some strawberries. 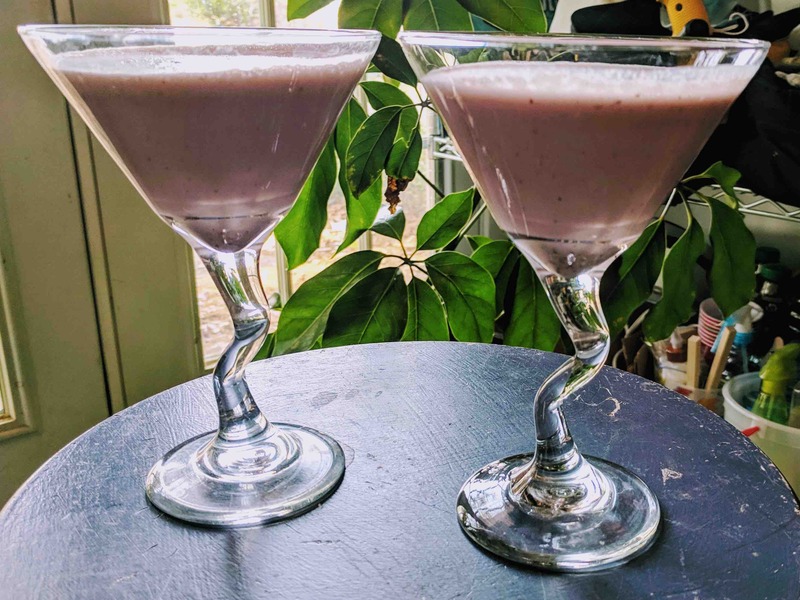 It works as a drink and, after some time in the freezer, as a sorbet like dessert. Place everything in a blender and puree until it is frothy and well mixed. Pour into glasses. For a pleasant kick to your cocktail add in some banana rum. Michelle has a Crock Pot Express Crock Multi-Cooker (like an Instant Pot). It is a pressure cooker, slow cooker, rice cooker, yogurt maker, and also steams, browns, sautés and tutors high school students in calculus. 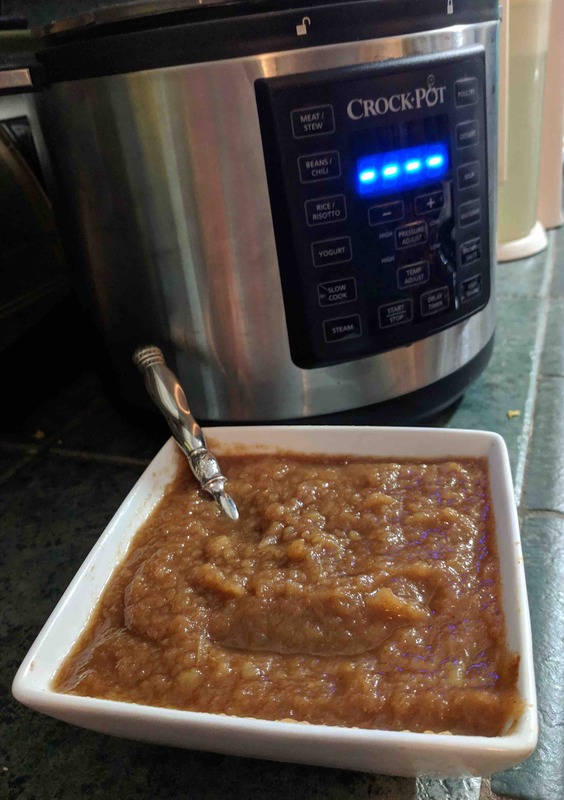 We used it most recently to speed up the process of making applesauce. As anyone knows who has stood over a skillet, stirring and mashing apples, this handy little device saved a lot of time and effort and we had great tasting applesauce to show for it. Use any combination of apples – I prefer the tartness of Granny Smith but adding red apples to the mix means less added sugar later. Peel, core and cut the apples into 8-12 slices. Place in the electric pressure cooker. Sprinkle over the cinnamon and toss to coat. Mix together the water and lemon juice and pour over the apples. Stir to combine. Put on the lid and cook on high for 8 minutes. Release the pressure safely. Mash the mixture together and, if it is too watery, use the browning function to cook a bit of the liquid off. Add seasoning and taste. Depending on the tartness of the apples, you may need to add more cinnamon in addition to the brown sugar and pinch of salt. Stir well to combine. Serve hot or cold. Store any uneaten portion in the refrigerator in an airtight container. 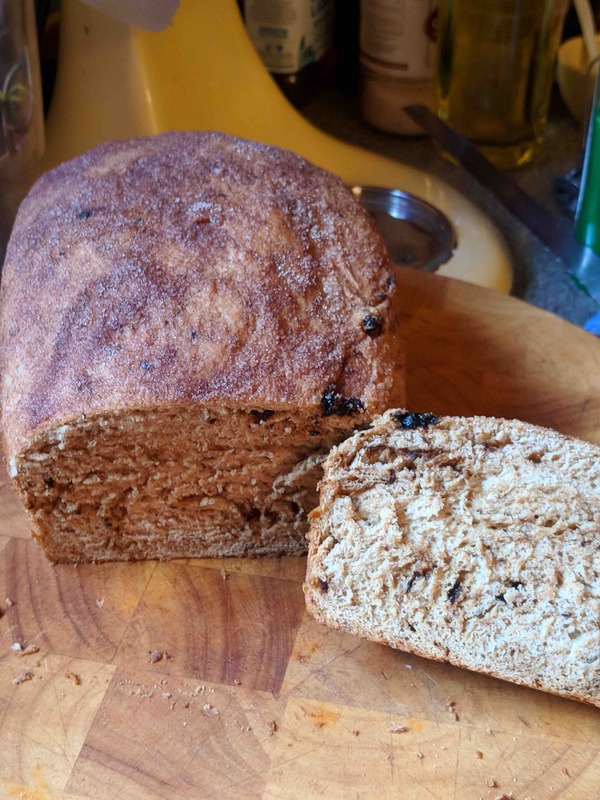 I had an urge for raisin bread on Sunday morning and searched through my recipes to find one that looked good. I flipped through my James Beard and Father Dominic cookbooks and ended up combining the best of both worlds. I set everything up before the New Orleans Saints kickoff so it was ready to be put it together during halftime. The dough rose during the second half and I divided the dough before overtime started. Once we won the game, I preheated the oven and began to bake. I make my own cinnamon sugar by combining 1/2 cup sugar with 2 tablespoons of ground cinnamon. For this recipe, you’ll need about 3 tablespoons of the cinnamon sugar, so store the rest in an air tight container for another use. If you don’t want to cook both loaves at once, after the first rise and once you’ve divided the dough, press the bubbles out of one half and wrap it in plastic and put in an airtight bag. You can now freeze the dough. Let it thaw in the fridge overnight before baking as described below. Sprinkle yeast over warm water in a bowl and stir gently to mix. Let proof for 10 minutes. Soften raisins by putting them in a steamer basket over boiling water while yeast proofs. Set aside once plump. Combine milk and butter in a small saucepan and heat until butter is almost entirely melted. Pour into a bowl of an electric mixture and let cool to lukewarm. Add yeast mixture, sugar, salt and eggs. Mix until well blended. Add five cups of flour, one cup at a time and stirring after each addition. Mix until dough begins to pull away from the side of the bowl. Stir in raisins. Knead the dough for 5 minutes. Add additional flour in half cup measures, as necessary, until you have a smooth and elastic dough. Place dough in a large, oiled bowl and turn to coat. Cover and place in a warm place (I put mine in the oven with the light on) for one hour or until doubled in bulk. 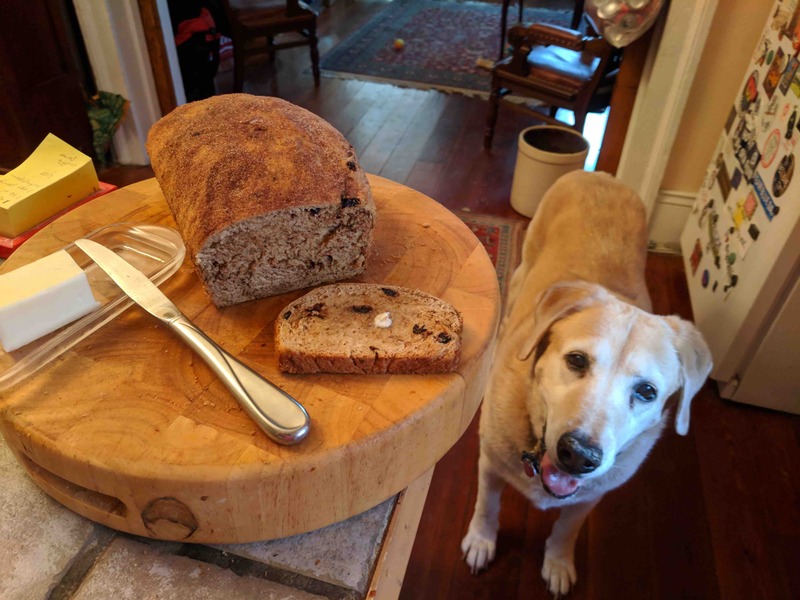 Punch down dough and form into two loaves. Place in lightly greased loaf pans. Cover and let rise for 45 minutes or until nearly doubled. Brush the top of each loaf with melted butter and sprinkle with cinnamon sugar. After the loaves have been rising for 30 minutes, preheat oven to 425 degrees F. Bake loaves for 10 minutes. Loosely cover the loaves with foil and reduce oven temperature to 350 degrees and bake for 25 to 30 minutes more. Loaves should sound hollow with tapped on the bottom. Remove from the pans and let cool on wire racks. I tried a new blueberry muffin recipe and they were pretty good. I usually make this Double Blueberry Muffins recipe, where you mash part of the blueberries. 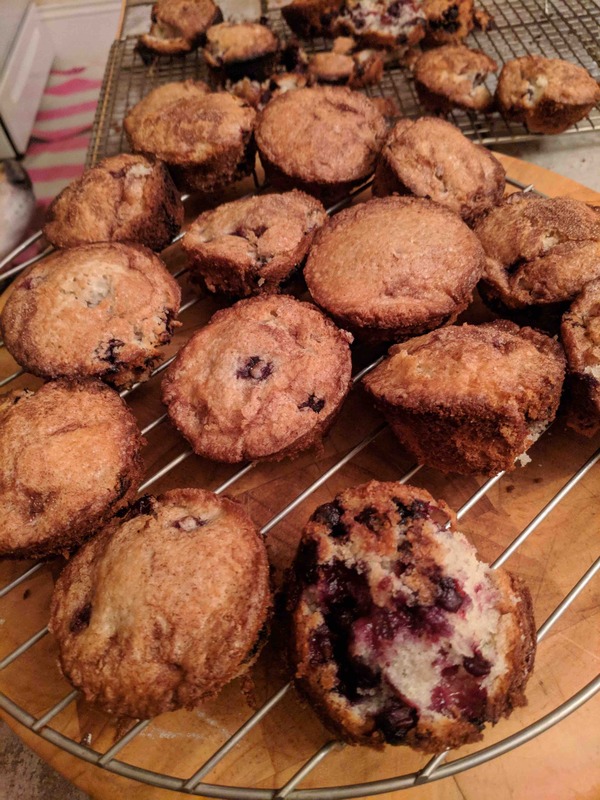 With less smashed fruit, the muffins in this recipe aren’t a strange grey from the blueberry juices, which was a plus as I brought them for the Forum for Equality Candidate Interviews for the upcoming election. Only problem was they didn’t want to come out of the muffin tins, so I ended up with a lot of muffin tops (which is frankly the best part). Next time, I’ll put these in cupcake papers, though. Cream the butter in a mixing bowl. Add the sugar and the extracts and mix to combine. Scrape down the bowl and then add the eggs one at a time. Add in one third of the dry ingredients. Pour in half the milk. Add in half of the remaining dry ingredients and then the rest of the milk. Add the final bit of dry ingredients. Scrape down the sides of the bowl and fold in the blueberries. Fill the muffin tins with batter. Sprinkle the tops with cinnamon sugar and bake in the preheated oven for 20-25 minutes or until a toothpick inserted into the center comes out clean. Rotate and switch the pans midway through baking. Let the muffins cool for 5 minutes in the pan before removing to a rack to cool completely. Summertime in the South means putting up with heat, humidity and mosquitos the size of small cars. As a consolation, summer also brings us peaches. It makes my soul happy when I hold its softly in my hand, breathe deep of its perfume before biting into it and letting the succulent juice run down my chin. Saving a few of them for ice cream makes me even happier. And, adding a little brandy to the mix can make a person nearly expire from happiness! Of course, if you choose not to use brandy, you can replace it with 2 tablespoons of vanilla extract. Peel and pit peaches; cut into chunks. Place all ingredients in a blender or food processor and puree until smooth. Refrigerate until cold. After it has set for a while in the refrigerator, blend everything one last time to ensure it is well mixed. Process in ice cream maker according to manufacturer’s instructions. Transfer to plastic container and freeze until firm. We are having fried chicken and waffles for dinner and decided we ought to kick the meal up a notch with a cocktail. 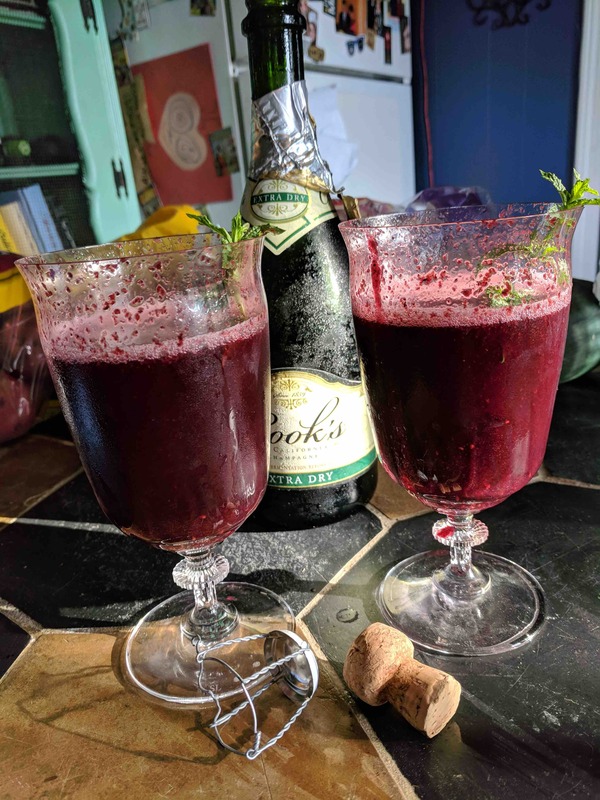 Michelle has been out picking wild blackberries, so we decided to have blackberry bellinis. This recipe makes 4 average drinks or 2 generous ones. In a blender, puree blackberries, mint leaves and honey. Let sit in blender for 15 minutes. Pulse again and then pour in a sieve over a bowl. Use a spatula to press out the juice from the seeds and leaves. Discard pulp. Let the juice sit in a bowl for another 15 minutes. You should end up with about a 1/2 cup of delicious juice. Put 2 tablespoons of juice in a glass and pour over your choice of sparkling wine. Pour only a little at first and let the bubbles calm down before slowly filling the glass. Garnish with mint and toast! Both Prince Harry and William attended Eton. It seems only fitting, as the older brother is best man when his younger brother gets married to Meghan Markle, to make another British dessert created at that school. The Eton Mess has layers of whipped cream, meringues and rough chopped strawberries. I could probably come up with a recipe but, seriously, this is a super easy dessert to make, especially if you use store bought meringues. Whip the cream with a little sugar and vanilla. Mix the chopped strawberries some sugar to get them juicy and to keep things sweet. Crumble the meringues and mix with the whipped cream. 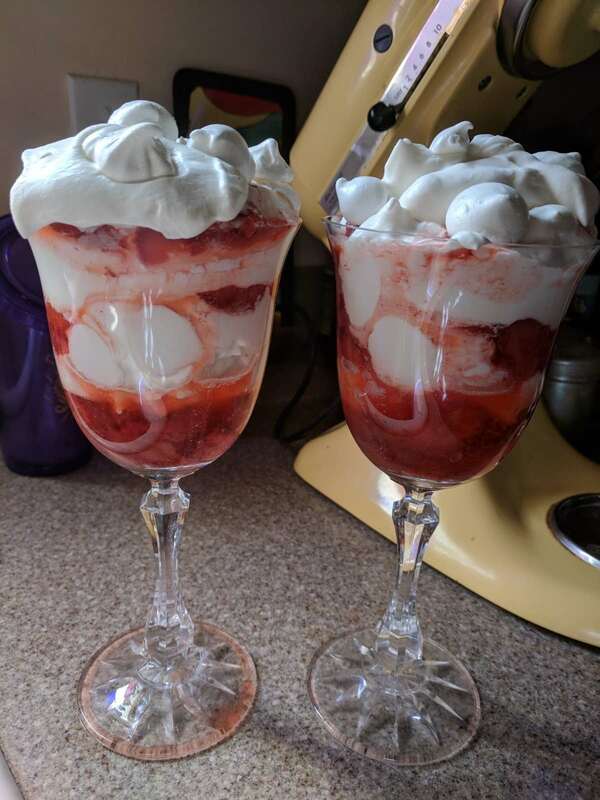 Your choice to either mix the strawberries with the cream to make a more traditional mess or to layer the whipped cream and strawberries in glass for a prettier presentation. In any event, prepare to gobble this up!